Hayward Manual Three-Way Ball Valves come standard with a two port TW ball allowing for three flow configurations within 180?of rotation. With the bottom port as the inlet, the flow can be directed out the left port, out the right port, or shutoff. A TW ball, used with the proper electric actuator, adds what is typically called a center off position to the NT flow pattern of actuated valves. 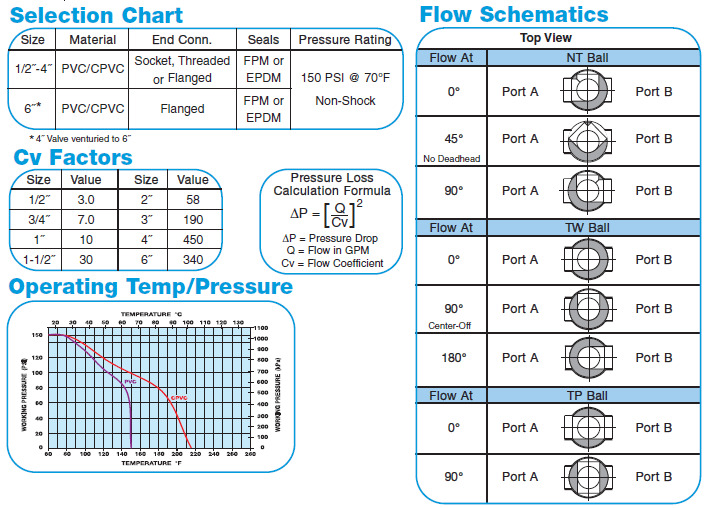 Optional NT ball (Recommended for actuated valves) is allowing for two flow configurations within 90?of rotation. With the bottom port as the inlet, the flow can be directed out the left port or right port, there is no shutoff position. Another optional TP ball, used with either manual or actuated valves, allows flow through all ports at the same time or flow shutoff. This makes these valves very easy to maintainby allowing for easy removal from apiping system without breaking down pipingconnections. Just unscrew the three assemblynuts and lift the valve body out of the line. A manual valve can be easily automated.Just remove the handle and install theActuator/Mounting Kit. The mounting saddleis integrally molded into the valve body. Forrock-solid actuator mounting, the valveincorporates a unique design whereby themounting bracket mounts directly to thevalve body. This assures proper alignment ofthe actuator to the valve without creatingany damaging side loads to cause prematurestem seal failure. 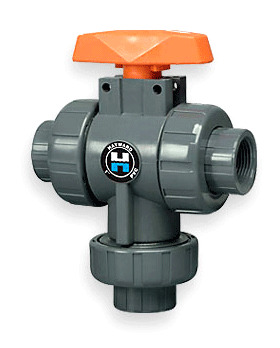 Hayward all-plastic Three-Way Valves containno metal parts. The valves will never failbecause of corrosion and they do notrequire painting or epoxy coating to standup to aggressive environments. 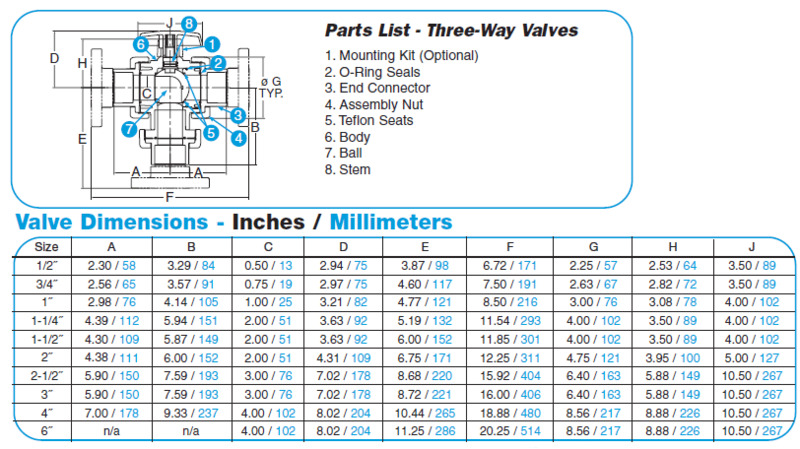 Hayward Ind Mtg Kit True Union & 3-way Ball Valve Sizes 2-1/2" to 6"